It has certainly been an eventful start to 2015. The majority of headlines have dealt with bitcoin price volatility, regulated U.S.-based bitcoin exchanges, and… well… bitcoin price volatility. Amidst the flurry of headlines I believe the most significant development in decentralized systems has been wildly overlooked — that of the IBM ADEPT publication and the functional IBM / SAMSUNG demo from the 2015 CES Conference built with Ethereum’s beta protocol — the implications of which are significant. I’d like to briefly shine my humble little spotlight on these here. IBM ADEPT Pre-Publication — Cliffnotes version: IBM states their case that decentralized P2P solutions (blockchain technology) are the preferred approach to enabling the future “Internet of Things” (IoT). Claims centralized approaches are too costly, not scalable, and lack privacy. The ADEPT (Autonomous Decentralized Peer-To-Peer Telemetry) platform describes how this approach might address these issues and enable a more ideal IoT. IBM on “Device Democracy” and the Internet of Things — Cliffnotes version: Gives context to the scale of the future IoT (billions of interconnected devices) and describes the shift from ‘special purpose computing’ to ‘general purpose’ computing with greater capability. 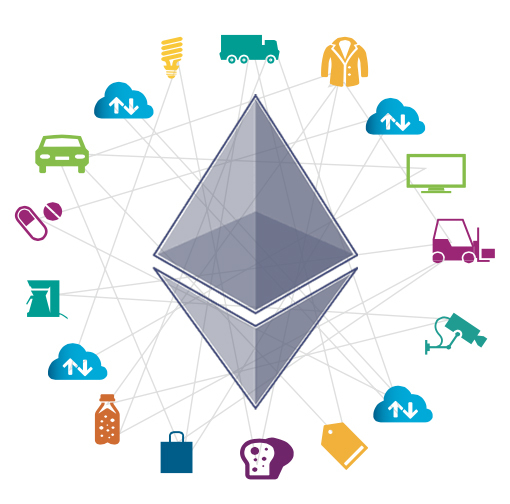 IBM / SAMSUNG ADEPT Demo (CES 2015 – Las Vegas, NV) — Cliffnotes version: IBM and Samsung have built a functional demo (based on the Ethereum Protocol beta-release) which demostrates the use of blockchain-based smart-contracts for appliance warranties. This is a big deal — one of the first working examples of such a use-case. As described in the papers and demo above — the potential impact that blockchain technology may have on the Internet of Things (IoT) is significant. As a more cost-effective, scalable, and secure solution blockchain technology will enable millions (possibly billions) of interconnected devices to behave autonomously in very sophisticated ways that were never before possible. What is most profound and game-changing is the ability for devices to behave autonomously and participate in not only the ‘Internet of Things’ but the ‘Economy of Things’. In the demo the presenter shares a use-case where a dishwasher detects that it is low on detergent and automatically proposes a new order of detergent. Such a capability foreshadows a host of future innovations for decentralized autonomous organizations (DAOs). Picture a self-driving Uber-equivalent refueling independently, getting an oil change, ordering new tires, paying tolls, renewing registration, etc. — all while paying for such services with it’s own earning from fares. In the second use-case demonstration we see something with implications equally as significant — the ability of a device to diagnose a failed part and reference the blockchain-based warranty contract. In such scenarios a remarkable amount of work is removed from the process of verifying warranty claims and providing services for repair or replacement. Currently most warranty claims involve significant costs — phone calls to customer service, employee salaries for customer service reps, time for verifying contracts, storage and security for warranty contracts, capital and labor for repair or replacement… the list goes on. In a world where devices operate autonomously — where warranties are completely secure and verifiable on a blockchain — such costs become almost non-existant. The device can sense a part failure, automatically verify the terms of the warranty contract, schedule the next necessary action (part replacement, repair, re-order, production, etc. ), pay for the required actions, and even schedule a proposed replacement date based on the secure calendar of the owner. When you combine this with a future where 3D printing is common another such scenario might include the proactive delivery of a computer-aided design (CAD) spec — so owners have the option to print and replace the part themselves. When considering devices with enhanced self-diagnostic techniques the pre-order of parts in anticipation of failure could significantly reduce down-times or the over-production of replacement parts. When discussing a future where the IoT is a reality many express fear that it will lead to a “1984-esque” scenario where privacy no longer exists and must be sacrificed to experience the benefits of interconnectedness. This is worth addressing here as the implications I’ve just discussed will most certainly raise the eyebrows of those sharing such concerns. Thanks to blockchain technology the benefits of a completely interconnected P2P world may be feasible with little-to-no sacrifice of personal privacy — blockchain technology is more likely to provide even more security and privacy then we currently experience in our less-connected existence — all the while reducing cost and enhancing experience. We may eventually have a world where we enjoy benefits we are only just beginning to imagine — where we get our cake and eat it too. It is year 6 of the post-blockchain world and we are only beginning to see the implications of decentralized autonomy. These early demonstrations are humble — but like the first brief flight by the Wright Brothers — they chart an entirely new realm of future possibility. This entry was tagged ADEPT, bitcoin, blockchain, Decentralized, device democracy, ethereum, IBM, Internet of Things, IoT, Samsung. Bookmark the permalink. Does anyone really equate voluntary sharing of information with the violent surveillance state of Nineteen Eighty-Four? I don’t really see the benefit to adding the overhead of cryptocoins to IOT unless you’re a capitalist or paranoid that others care about your personal information. It seems like it would be a detriment to everyone else involved. Can you go into that further? Regarding you first question: “Does anyone really equate voluntary sharing of information with the violent surveillance state of Nineteen Eighty-Four?” — I would imagine any response to this to be somewhat subjective and would also acknowledge that “1984” would be an extreme case, I certainly don’t imagine I speak for everyone. With that in mind, many who look at the long term trends of interconnectedness via technology, data security, and privacy — extrapolate a justified concern for the future Internet of Things (IoT). I don’t believe it is so much the about the voluntary sharing of information as it is about the false “perception” of privacy and security. If we were to have the vital systems of society completely interconnected almost all facets of data and technology would be subject to hacking. One small example is the idea of pacemakers connected to networks — a world where someones heart could be stopped by a hacker half-way across the planet. When participating with any network much of the value/benefits gained by the user is dependent upon participation — i.g. “giving your Groupon application permission to use your GPS coordinates to give you local deals and promos”. To get the benefit you’re voluntarily sharing your information. I for one am not overly considered with my information being public — in fact I like the idea of greater transparency and honesty in society. That said, many would prefer to gain network benefits while not having to completely give up their data. Regarding your second question – “the utility of using blockchain tech (crypto coins) as the foundation for the IoT”: When discussing bitcoin / blockchain tech many point out that it is not private — the invention in itself is a public ledger that can be viewed by anyone and regardless of its pseudonymous natures there will always be ways to track your activity. This may be correct at the protocol level — but blockchain tech / crypto-token systems are really just foundational P2P protocols. Applications can and are being built on top of blockchain tech to enable known individuals to interact in a P2P manner — securely and privately. Cryptographically provable voting applications that can prove you’ve voted but will never reveal for whom. This goes for messaging services, databases, etc. Thanks to public key cryptography individuals will be able to operate as entities on a blockchain based network and gain many of the benefits of shared data while not having to entirely share their own — or doing so anonymously. (A nice example of this is my post on the use of Blockchain tech and healthcare: https://rywalk.wordpress.com/2014/11/10/healthcare-and-the-blockchain/ — sharing your health data securely and privately and getting automated health diagnosis / recommendations based on population health). In fact, IBM’s ADEPT platform that I discussed in my post was actually chosen for the sole fact that it can provide better privacy and security for a P2P network then the existing rails ever could. Going back the pacemaker example from before — if pacemakers of the future are secured with blockchain based private keys you will never have to worry about someone “hacking your heart”. This metaphor could be extended further to any entity / device / individual participating in the IoT and allow us to fully exploit its potential beyond convenience and into greater utility. Thanks for your feedback and dialogue! Reblogged this on Preston Byrne.